I have to admit that I was stunned to discover that this CD is still in print and available for purchase, especially since the copyright date is 1972 and I didn't think this was ever a particularly hot-selling item. Still, it's out there and you can pick it up fairly inexpensively. It's certainly worth the effort. For those who may not know who the hell ELF is, allow me to explain. If you were to hear even one track from this CD you would instantly recognize its importance to hard rock/heavy metal. For the lead vocalist in Elf is none other than Ronnie James Dio. Way back before "Holy Diver," Dio (then known under his birth name of Ronald Padavona) recorded this bluesy, well done hard rock album that sounds like a cross between Deep Purple and (believe it or not) Great White(!). Okay, the Great White resemblance is only passing. However, the Deep Purple similarity is not. "Elf" was produced by Roger Glover and Ian Paice, Purple's bassist and drummer, respectively. To say that "Elf" bears no resemblance to Dio, the band, wouldn't quite be the truth. The excellent songwriting is apparent throughout, the music is tight and - as previously mentioned - very bluesy, and Ronnie's vocals are still nothing short of amazing. Of course, Elf isn't as heavy as Dio, just as Deep Purple isn't as heavy as Dio. Nonetheless, "Elf" isn't a bad record, and it certainly has its place in hard rock / heavy metal history. 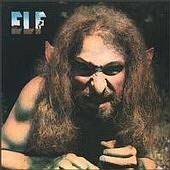 Elf: Ronald Padavona - bass and vocals; David Feinstein - guitar; Gary Driscoll - drums; Mickey Lee Soule - piano.